Stay up-to-date on everything happening at the Elementary building and connect with parents and staff by joining MemberHub. It's free and easy, just click here to get started! bit.ly/frostpk5 Already joined? Go to cafrostelem.memberhub.com to sign in! ​The Middle/High also has a MemberHub account for Middle/High families. Please visit the Middle/High pages for that link. The Elementary office is closed for the summer. The Middle High office is open Monday-Thursday, 7 AM - 3 PM. Call CA Frost's office with all changes in pick-up or drop-off service; these must be called into the Transportation Department by CA Frost's office and not the parent. Plan ahead - it will take 3-5 days for the Transportation Office to process a change. Students must be at their assigned bus stop five minutes ahead of schedule. 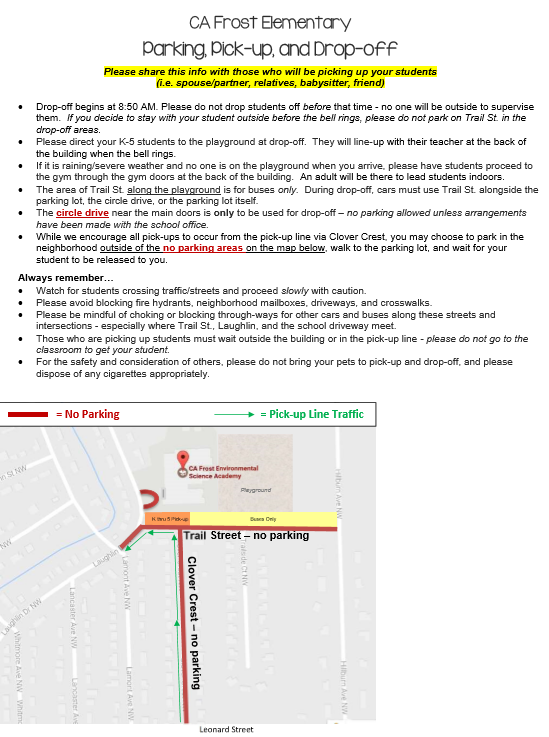 If there is a question about the time of pick-up/drop-off for a student with "near corner" or "door-to-door" service, or a concern about the safety or location of a bus stop, parents should call the Transportation Office directly at 616-819-3000. Your child will be sent home via their normal means of transportation unless the office has been advised before 3:30 or a note has been sent indicating otherwise. If your child will be going home with a friend, a note of permission will need to be sent to your student's teacher on or prior to the day. The hosting parent will also need to send a note indicating their permission. This is to ensure that both households are aware and approve of the arrangement, as kids often make their own plans for "play dates" and such. If your child needs to leave school prior to the end of the school day for an appointment, please advise your student's teacher in writing. You must come to the office; the secretary will have your child come to the office to meet you. You will also need to sign out your child with time, date and name of person picking them up. Students will not be released to anyone not listed as having permission on the student's registration form. Report absences by calling the office 616-819-2550, preferably before 9:00 AM and no later than noon. You must report absences each day your student will be out or the absence will be considered unexcused. Multiple unexcused absences will be followed up by the principal and/or a family support specialist. Medications that needs to be administered at school must be brought to the office by a parent in its original prescription packaging and accompanied by a medication permission slip signed by your physician. You must have a current volunteer badge to participate. Badges are good for two years. If you have never had one or if yours is expired, you must submit an application to the office. Applications are available online at grps.org/volunteer or in the office. Filling the application out online shortens processing time. See the Elementary Events & Volunteer page for listed opportunities and material needs. Our Elementary building participates in the Terracycle program. This means we collect items that would normally go to the landfill because they can't be recycled or composted. When we have enough of these items, they are sent to Terracycle and we earn points. For more information on program, visit www.terracycle.com​. The file below show in which brigades we participate.